Adam Smale is a guitarist, composer, teacher, and life-long student of music and the guitar. While growing up in rural Northern Ontario, Canada, Adam fell in love with music and the guitar at a young age. By 9 years old was figuring out songs from his Dad’s record collection. Scotch Boogie was the first song he learned by ear, recorded by Canadian guitarist Ken Davidson. Then it was on to The Ventures, various Bluegrass tunes, some songs Chet Atkins recorded, then the Beatles, ZZ Top, and Van Halen. He became a member of the musician’s union at the age of 12. By 14, Adam was on stage gaining valuable experiences as a performer at bars, weddings, and community dances. 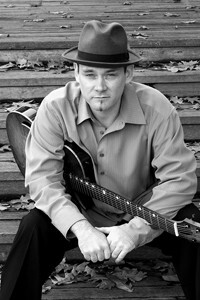 Much later, inspired by the late Lenny Breau, Adam began to play with a fingerstyle technique, including the use of a thumb-pick–a return to his “Chet Atkins” days. He mainly plays two 7-string guitars: an electric he designed and had built for him, and a nylon string acoustic guitar he designed and built himself. Adam has played many styles of music over his career but now primarily performs Jazz. He has also began dipping his hand into the exciting world of Flamenco guitar which has in turn influenced some of his compositions. Adam has conducted master classes and seminars in Canada & the US, for Guitar Workshop Plus, the National Guitar Workshop, and Western Michigan University, Western Illinois University, as well as juggling private students over the past 20+ years. Adam holds a Masters degree in Jazz Performance from Western Michigan University, and a Bachelor degree in Jazz Studies from Humber College. He currently lives in New York City.